Sweating is but normal to one’s body as the perspiration signifies the response of the brain through the sympathetic nervous system to the sudden change of body temperature. This is due to some factors like sun exposure, physical exercise and even tension. But excessive sweating like in the armpit creates problem to some, especially if it shows on their clothes. Visible armpit sweat does not only cause embarrassed moments, but can also give bad impression and create bad odors too. Therefore, I try to stay as dry as possible throughout the summer months. Aluminum based compound is the active ingredients of all antiperspirant which work on the sweat glands and prevent them from sweat secretion. Individuals who sweat excessively can use antiperspirant with aluminum concentration of 10-15% percent. Those who have more severe sweating, need prescription antiperspirant which has an aluminum chloride content of 20% concentration. Topical antiperspirants are typically the first line of treatment for Hyperhidrosis of the palms, feet, and underarms. Treatment with these products does not stop sweating, it simply traps the perspiration within the obstructed sweat duct. The second type of undershirt is a shirt made out of modal fabric. Modal fabric is one of the BEST fabrics you can buy when it comes to sweating. A semi-synthetic cellulose fiber, Modal is classed as a type of Rayon. At 50% more absorbent than cotton, Modal is excellent at wicking moisture away from the body and keeping you feeling fresh and cool. Therefore, modal underwear could absorb more sweat and keep the body dry and feeling cool. The Mission EnduraCoolInstant Cooling Towel is made from a proprietary performance fabric that instantly cools when soaked with water, wrung out, and then snapped in the air to activate the cooling properties. The proprietary technology works by absorbing moisture and perspiration into the fabric core where the unique radiator-like fiber construction circulates water molecules and regulates the rate of evaporation to create a prolonged cooling effect. This towel is perfect on those hot days. I usually just wear it around neck or on my head. O2COOL's ArcticSqueeze is a water bottle that doubles as a personal mister, to keep you cool. Its insulated design keeps your water colder longer. O2COOL’s patented Mist 'N Sip provides a unique combination all in one - Misting and Drinking. The mist feature helps to cool you down on the outside while you stay hydrated on the inside. I used to product almost everyday this summer, when i was forced to work outside at work. Whenever i started to get too hot, I would just spray a mist of water in my face. I found myself mainly using this bottle as a mister. 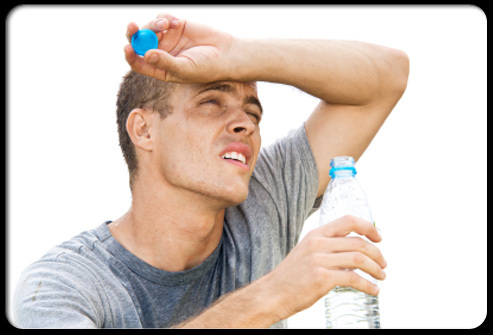 One of the simplest ways and a no brainier to curb excessive sweating is by drinking plenty of water. When your body is properly hydrated, it doesn’t have to work as hard to regulate your body temperature, less work = less sweat. Simple, yet effective. On top of this, I like to carry around a frozen water bottle. On those really hot days, a frozen bottle can keep you cool. As the bottle melts, you can drink the extra cool water.